Stephen Colbert has figured out how to reach people, and Catholic educators should take notice. Since the debut of his late-night satirical news show, “The Colbert Report,” in 2005, Colbert has gained immense popularity. Each night his program opens to the thunderous applause and chanting of a packed studio audience. The show has garnered many awards, including two primetime Emmys, several additional nominations and the honor of coining the Merriam-Webster word of the year for 2006: truthiness. Yet Mr. Colbert’s influence goes beyond introducing new vocabulary into American culture. In an article in The New York Times in 2012, Charles McGrath observed that Colbert’s conservative, blowhard persona was beginning to transgress the bounds of his television studio and meddle in the real world. Fans of the show do not just tune in for a laugh, turn off the TV set at show’s end and forget about it. They take action based on what they hear, and our culture has been changed as a result. As members of a church tasked with reaching out to the world in a new evangelization, teachers of the Catholic faith should be intrigued by the way Stephen Colbert has captivated his audience. What might we do to be as effective in spreading the Gospel of Jesus Christ as Colbert has been in spreading the gospel of Stephen? Instead of spying on the Sunday school classroom where Mr. Colbert has served as a Catholic catechist, I suggest attending to the place where he is most in his element—on air. Stephen Colbert’s meteoric rise to fame has been aided by his charismatic personality, improv comedy training and a talented team of writers—advantages the average catechist cannot count on. Yet there is something more basic and replicable underlying his success. Indeed, I have come to the rather surprising conclusion that he embodies (unintentionally, no doubt) a formula for effective catechesis proffered by St. Augustine of Hippo in the fourth and fifth centuries: delight, instruct and persuade. First, Augustine tells catechists in On Christian Doctrine that they must delight their audience: “A hearer must be delighted, so that he can be gripped and made to listen.” This church father knew that it matters little whether one speaks the truth if one’s audience is not interested enough to pay attention. A boring presentation makes an audience less receptive and less likely to return, while a pleasing presentation renders an audience eager to listen and even to come back for more. In short, style makes a difference. Augustine practiced what he preached. A classically trained orator, his golden tongue was known to move his audiences to tears or applause or both. People today are at least as hungry for entertainment as they were in Augustine’s time, but what passes for delightful changes with the times. People may no longer flock to public squares to hear great orators, but millions are tuning in to “The Colbert Report” every night, and it is not difficult to understand why. Stephen Colbert is utterly delightful. With impeccable wit and timing, he ridicules politicians’ foibles and blunders, extols his own virtues and revels in consumerist decadence and pop culture fads, all with a tongue-in-cheek, wink-of-the-eye demeanor that keeps his audience in hysterics. If the torrent of rapid-fire jokes were not enough to keep viewers engaged, Colbert varies his delivery with an ever-expanding arsenal of recurring segments. These include the “ThreatDown” in which he identifies the newest threats to the American public (frequently including bears and robots) and “The Word,” in which his discussion of current events is punctuated by the periodic appearance of punny asides on the screen. In one session of “The Word,” Colbert reported on an Iowa hospital’s deportation of two comatose immigrant workers without any prompting from the government. Following a clip from the local news, Colbert quipped sarcastically: “Deported is such a harsh word. The hospital simply moved them to the intensive we-don’t-care unit.” Meanwhile, “The I. Don’t C. U.” flashes on the screen above the host’s shoulder. Colbert appears to have found the sweet spot for modern audiences with his blend of humor and a barrage of media-enhanced segments. Fortunately, these modes of expression can just as well serve as tools for evangelization as for political satire. Catechists would do well to avail themselves of whatever opportunities current popular culture presents for drawing people into the Catholic faith. Augustine also emphasized the importance of instructing the audience. Though an engaging style is helpful for gaining and holding an audience’s attention, a Christian teacher’s primary aim is not to entertain but rather to hand on God’s saving truth. The best method of teaching is not necessarily the most amusing but rather “one by which the listener hears the truth and understands what he hears.” In this regard, too, Colbert has proven himself a master. Jesus did not teach trivia. He taught “words of eternal life” (Jn 6:68) that transform his followers and lead to salvation. The most important indicator of the effectiveness of Catholic catechesis will be the extent to which our students not only know the truth God has revealed but also “do the truth in love.” One can hardly expect students to live out a faith whose content they neither know nor understand. Any teachers who neglect God’s revealed truth in their lessons are building houses upon sand. Finally, Augustine underscores the need to persuade one’s audience. Essential though knowledge is, teaching falls short if students’ learning does not affect their living. This is eminently true in the case of Christian teaching, whose definitive aim is a lived relationship with Christ. Developing such a relationship requires learners to internalize the truth they have learned and make a personal decision for Christ. For, as Augustine notes, the person who still needs to be enticed with delightful speech to do the right thing has not yet fully grasped the meaning of Christ’s truth. What is perhaps most impressive and even a little uncanny about Colbert is his ability to regularly persuade his vast audience to take action. Despite the fact that the Colber Report is a comedy show, it is evident in exchanges like the one above with Potter on the show, and even more in his testimony about migrant worker rights before a House Judiciary subcommittee in 2008, that this fake-news host intends for his audience to take action in the real word on the information he presents. When Colbert wants his viewers to do something, he does not settle for a vague, innocuous suggestion. He tells them explicitly what ought to be done…and they do it. In 2006, for example, Colbert proclaimed facetiously from his desktop pulpit that, thanks to Wikipedia, if enough people agree on something, it becomes true. To prove his point, he urged viewers to modify the Wikipedia article on elephants to say, “Elephant population in Africa has tripled over the past six months.” The response was so immediate and overwhelming that Wikipedia had to restrict editing of the page to prevent further changes. Catholic catechesis has been conspicuously less effective in this regard, so much so that the Second Vatican Council, in the “Pastoral Constitution on the Church in the Modern World,” lamented the “split between the faith which many profess and their daily lives” as one of the most serious problems of our age. It is not enough to teach students what Jesus and his church teach or even what that teaching has to do with their lives. Catechists need to convince them that Jesus is worth loving and the way of life to which he calls us is worth living. And there is no argument more convincing than the witness of the teacher’s own lived faith. By offering such a model of discipleship and bringing students’ existential questions and concerns into dialogue with church teaching, catechists provide them with the roadmap they need to translate their learning into their daily lives. So how has Colbert been so effective in reaching his audience? How might Catholic catechists do likewise? In a word, by appealing to the whole person. When Jesus invited us to follow him, he urged us to do so with nothing less than our full selves. He commanded, “You shall love the Lord your God with all your heart, and with all your soul, and with all your mind, and with all your strength” (Mk 12:30; cf. Lk 10:27). If we want our students to seek Christ with their whole selves, we must engage them in the fullness of their being—heart, mind and will. St. Augustine long ago offered a formula for doing just this: delight the heart, instruct the mind, persuade the will. Stephen Colbert has demonstrated that this formula is still effective in our own time. If Catholic catechists were to apply the lessons of Colbert’s success to their own work of evangelization, our country might very well become not just a “Colbert Nation” but a people of God. 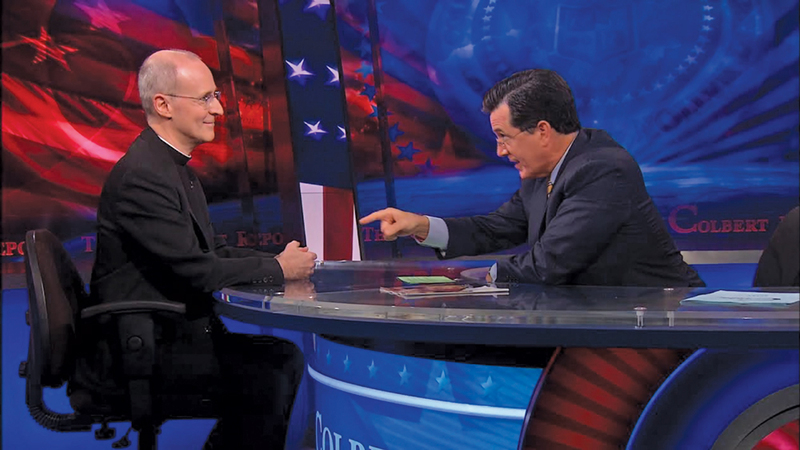 Watch clips from Father James Martin's apperances on "The Colbert Report." Great post Patrick. Your juxtaposition has given me a lot to think about - thanks. These two men have participated in creating a community and a voice for many who felt that there was no place for them. This is really nothing less than the work of the proclamation of the Kingdom of God. With bravery but also with tender love and compassion (and a great dose of beautiful laughter), this work has been done. So now we can happily say that those who bless the poor shall themselves find blessing! Thank you, Patrick, for your article. The relaxed manner in which the Colbert show runs belies all the hard work that goes on behind the scenes. His writers must troll all the network news shows to grab headlines and stories that are then subjected to the Colbert treatment. Often the media itself is the subject of ridicule, like the media's coverage of the recent frigid weather. Steven strung together a half-dozen or so snippets from news and weather reports of anchors, reporters, and pundits all mouthing the same catch phrases "polar vortex" and "thundersnow" which, Steven observes, sound so "sciencey" (link: http://www.colbertnation.com/the-colbert-report-videos/431859/january-06-2014/polar-vortex ). Preparing for catechesis necessarily demands the same hard work if it is to delight, inform, and persuade. Father Martin's appearances are very entertaining and instructive, and I try to catch all of them. Readers should be aware, however, that while much of the off-color language is bleeped, so called "adult humor" abounds in his shows. Stephanie, I can't agree with you more about Fr. Martin and Stephen Cobert. I'm trusting Pope Francis to lead the pack. Thanks Patrick. You have given us a lot to think about. The best is your quote from the Pastoral Constitution of the CChurch which urges direct contact and engagement with Jesus. While Colbert's genius is clear and his presentation of religous subjects, as well as others, is unique, your example of his leading his listeners to action limps horribly. They really practiced a prank rather than preached the gospel to the poor, or fed the hungry or helped the blind see. Glad you quoted the more important words of Augustine. Namely that anyone who needs to be entertained to follow Jesus has a questionable metanoia. Yet there is no reason, of course to be lifeless about proclaiming the Lord. And remember Augustine left us a terrible legacy in saying we could use violence to keep Catholics orthodox. I mean what happened to his "delight, instruct and persuade" then? Yet you did get us to think creatively about the matter which makes your article a distinct success. One of Colbert's best programs was when he presented the great Katherine Boo to his audience. Boo wrote the outstanding book http://www.colbertnation.com/the-colbert-report-videos/410489/march-12-2012/katherine-boo"Behind the Beautiful Forevers" which gives us an outstanding view of the very poor that Francis talks about. That book certainly should be read by catechists who should encourage their students to feel for these children. A better example of how Colbert leads his "Nation" to action is the numerous charitable efforts he has initiated on his show. His efforts have helped raise more than a million dollars for a variety of charities, and not only did he persuade the Colbert Nation to participate, they did it enthusiastically and generously. Combine the charitable efforts with Father James Martin's very popular and successful appearances on the show and you have some pretty good stealth catechesis happening. This article also appeared in print, under the headline "Truth and Truthiness," in the February 3, 2014 issue. Patrick R. Manning, a doctoral student in theology and education at Boston College, is a religious educator. He serves as a summer faculty member at the University of Notre Dame in addition to conducting catechist training and theological presentations.